Life is about change. How many decisions have we made along the way from being a child to growing up, going to school, making new friends and pondering what our futures will be. For some, life is been rougher than others. They live day to day not knowing what tomorrow will bring. LeBron James was one of them. Yes, the same LeBron James who helped the Cleveland Cavaliers rally from a 3-1 series deficit to defeat the defending NBA champion Golden State Warriors in June to give the city of Cleveland its first professional championship in 52 years. His mother was only 16-years-old when he was born. The family moved from apartment to apartment while his mother tried to find steady employment. In an effort to provide a more stable environment, she allowed LeBron to move in with the family of a local youth football coach in Akron, Ohio. From there, LeBron excelled in athletics. We all know about his basketball prowess, but he was also an exceptional football player earning all-state honors in his sophomore and junior seasons as a wide receiver. He was recruited by a passel of Division I universities including Notre Dame. But LeBron was the first pick of the Cavaliers in the 2003 NBA draft and he quickly reached stardom. When his contract expired, he signed with the Miami Heat and won back-to-back titles in 2012 and 2013. His NBA record is a laundry list of achievements. At the age of 31, the 6-foot-8 forward has already won three NBA titles, four Most Valuable Player awards, three NBA Finals MVP awards and two Olympic Gold Medals (2008 and 2012,) despite not playing at this year’s Olympic Summer Games in Rio de Janeiro, Brazil. James won the NBA scoring title in 2008 and was the Rookie of the Year in 2004. He played on a dozen NBA Eastern Conference all-star teams and twice was named the game’s MVP. But one of his greatest achievements is happening off the court. 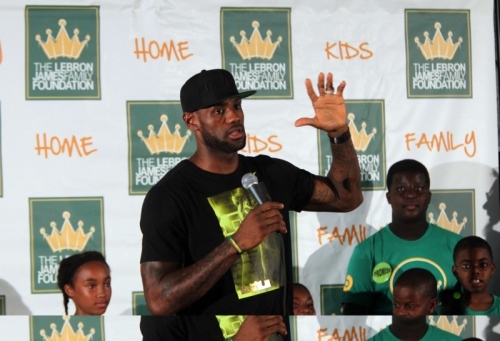 While many of us fail to remember the people who helped us along the way, LeBron has scored a big assist by donating $41 million to put 1,100 Ohio kids through college. Through his partnership with the University of Akron, kids enrolled in his “I Promise” program will have the opportunity to receive a fully guaranteed four-year college scholarship. The scholarship will cover tuition and general service fees totaling approximately $9,500 per year. Students enrolled in the program need to graduate high school within Akron’s public school system and fulfill a community service obligation. But with James commitment, these kids will be able to get a better education. And for LeBron, whose net worth is $223 million according to MoneyNation.com, it’s a slam dunk!